A true game changer may be coming on to the market. The new smartphone, launched out of China, is making a very bold claim; the creators are saying that their new phone, the Oukitel K10000, only needs to be charged every 10-15 days with normal use. Is this true? Could this change the face of smartphones as we know it? According to the makers of the phone, the difference between the Oukitel and traditional smartphones is the battery power. The Oukitel contains a 10,000mAh battery, which offers more than five times the charge that an iPhone does. The only downside so far? The phone takes a reported three hours plus to charge fully, but once you’re charged, you’re good to go for…two weeks? Is that even possible? What is Oukitel doing that none of our American phone companies are doing? Well, besides creating a phone with a ridiculously powerful battery, Oukitel has also digged deep into battery conservation, and created a smartphone that offers a standby mode as well as special features that claim to consume less power than a traditional phone. You can even use the Oukitel phone to charge other gadgets. Though it seems to good to be true, the fact is, it probably is. Though the phone may have a long battery life, it seems to be short on other features. It does have a 5.5-inch screen, and the Android phone features an 8.0 MP back camera and a 2.0 MP front camera. It may not have everything an iPhone has, including apps and other features, but it does include an HD screen for sharp picture, as well as “touch gesture” functions. 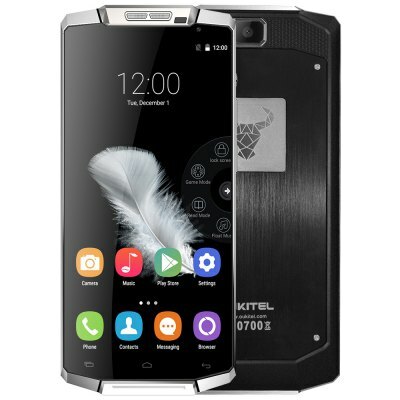 The Oukitel K10000 also includes Lollipop OS software, and a 64 bit, quad core processor. So, how does this phone, which hopes to break the Guinness world record for longest battery, stack up against other smartphones? Critics are a little worried that the phone’s claims of extended battery life won’t come to pass. Considering there are already smartphones with powerful batteries available, such as the Galaxy Note 5, which offers a 3,000mAh battery and requires recharging after only one day of use. The downside of the Oukitel is its bulky aesthetic. The bigger, larger battery makes the phone a bit thicker and heavier than regular phones, which may prove to be one of its least popular features. The phone measures in at twice the width of the latest iPhone, making it a little harder to slip into a pocket easily. The price tag is reasonable, at $249, but is this enough to make die hard Samsung or Apple fans ditch their phones in favor of the promise of longer battery life? Or will users continue to download apps to help them conserve power on their existing phones, or purchase battery phone cases like the latest one from Apple? The Oukitel K10000 ships in January.